Posted on Sat, Mar 17, 2012 : 4:57 p.m. 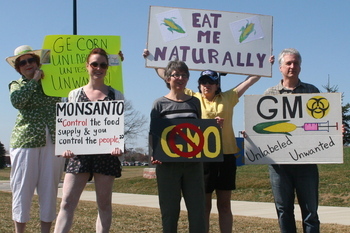 Seven people carrying signs marched in solidarity along the Michigan Avenue side of Walmart near Saline Saturday afternoon to protest against the nation's largest food retailer's plan to sell Monsanto's first genetically engineered sweet corn. They chanted, "Processed, frozen, fresh, or canned, GMOs must be banned," and "Walmart, just say no to GMO." Protestors outside of Walmart near Saline. The national consumer organization Food & Water Watch is leading the national campaign and is calling Saturday a National Day of Action. Volunteers across the nation are organizing events at Walmarts to let the company know that consumers don't want the genetically modified corn because it is a potentially dangerous product. The goal is to convince Walmart to commit to not selling it by April 1, the date when the corn would first be planted. "Whether you shop at Walmart or not, they are the largest U.S. food retailer, and if they won't sell genetically engineered sweet corn, it's likely that farmers won't plant it," said Kurt Gleichman of Saline, who along with his wife Hillary organized Saturday's local protest. "Genetically engineered sweet corn will not be labeled, so you won't know what you're buying." Walmart issued a statement last week saying that it hasn't yet made a decision about whether it will sell the corn, but stated that it is aware of the concern. Roundup Ready GE sweet corn is the first genetically engineered vegetable of this type to be commercialized by Monsanto. It was approved by the USDA. Gleichman says that Monsanto's genetically engineered sweet corn has not been tested for human safety and that it contains three different genetically engineered traits that were previously approved but that have never been used in food eaten directly by people. They are corn-borer resistance, rootworm resistance, and tolerance for glyphosate, the main ingredient in Monsanto's herbicide Roundup. "It's bad enough that GE ingredients in some form or another are in about 80 percent of highly processed foods like cookies and chips, but with this new genetically engineered sweet corn, even people who avoid packaged junk food for fresh corn could run the risk of unknowingly consuming high doses of genetically engineered material since labeling is not required," said Wenonah Hauter, executive director of Food & Water Watch. Genetically engineered sweet corn is intended for frozen and canned corn products, but could also be sold as corn on the cob. Mon, Mar 19, 2012 : 4:04 a.m.
Hey Kurt, go buy your corn elsewhere. Go protest Monsanto or the FDA that approved this corn. Leave Walmart and free enterprise alone. Their not the enemy, your government and special interest, including unions are influencing this product. Go after them. Sun, Mar 18, 2012 : 8:59 p.m. The bigger picture is to not shop at WalMart in the first place!!!!! Sun, Mar 18, 2012 : 4:25 p.m.
Sun, Mar 18, 2012 : 3:06 p.m.
Grow up people. There is NOTHING you eat which has not been genetically modified by humans. The new methods are simply faster and more efficient than the old ones. Mon, Mar 19, 2012 : 3:55 a.m.
Sun, Mar 18, 2012 : 11:04 p.m.
Sweet corn is a great example of this, having been domesticated 9000 years ago from a Central American grass. Sun, Mar 18, 2012 : 1:52 p.m. Convince people to buy locally grown heirloom varieties of food at stores that understand the importance of this. Set the example. Yes, it costs more money. It's worth the extra money. If Wal-mart sees their sales impacted they'll change. So long as eaters only compare on price nothing good will happen. If all the effort being put into getting top-down centralized systems to change were directed into building up local, distributed systems we'd make much more progress. It would also provide more political cover to local farmers who are being harassed by our federal minders while a blind eye is turned towards Big Ag. Sun, Mar 18, 2012 : 1:28 p.m.
During the summer you should be buying local fresh produce. Anything in the stores you cannot guarantee where it comes from. I drive out to Blocks out on Middle Belt because the local growers bring in all of their freshly grown stuff to be sold locally there. Trust me, half the time I can't get a parking space. Think local and keep in the economy. Mon, Mar 19, 2012 : 3:09 p.m. Blocks will tell you where it comes from it you are a concerned citizen. Otherwise, it is worth the drive. Sun, Mar 18, 2012 : 2:18 p.m. While I fully support 'buying local', don't necessarily think that driving out to Block's insures that you are buying 'local', non-GMO produce. Sun, Mar 18, 2012 : 1:07 p.m. The best way to support buying organic foods, is to not purchase the genetically made foods that seem to be making their way onto the store selves. Just look at the pink slime issue that just came up -- what does FDA do again? Sun, Mar 18, 2012 : 1:25 p.m.
Did you see that article on the pink meat that McD gets? Totally gross. I will never go there ever again after seeing that video. Ew. We too make sure it is grown healthy not thru genetics. If I want genetics? I will watch my grandchildren grow up healthy. Sun, Mar 18, 2012 : 4:16 a.m. Seriously, seven protesters? OK, consider a little perspective here. Sweet corn is probably the most &quot;local&quot; vegetable crop we grow in the US. There is a good reason for this. Only about 5% of what we buy is actually consumed because so much is the husk and the cob. We love this vegetable, but it isn't something that should be shipped very far. Most states grow their own, in-season sweet corn. This is mostly done by small growers. Unfortunately, it is very hard to protect sweet corn from damage by caterpillar pests. In some areas it takes as many as 20 insecticide sprays per season to grow corn that consumers would accept (no worms and worm frass in the tip). In Maine, your growers have it much easier. Bt (GMO) sweet corn has been available since the late 1990s from Syngenta. Monsanto is just offering a new option this year. Syngenta has another generation coming in around 2 years. The only reason that this relatively small crop (200K acres) can have this option is that it can be &quot;conventionally&quot; bred into sweet corn from field corn. No other vegetable crop really has that option. So here is the deal. If the anti GMO folks are successful (as they almost certainly will be), grocery retailers, processors etc will avoid the GMO sweet corn which only has the same protein that has been sprayed for decades on Organic and conventional crops. The only players who will be at a disadvantage are all those local growers who have to keep spraying insecticides. The insecticide use isn't a consumer issue because when you husk the corn there are really no residues left. This is a farmer issue. If people actually care about their local farmers, they might need to re-think their easy manipulation by anti-GMO voices. Sun, Mar 18, 2012 : 4:11 a.m.
Well, I wouldn't be buying fresh sweet corn at Walmart anyway. Not even for bait piles. Sat, Mar 17, 2012 : 11:08 p.m.
Gleichman says that Monsanto's genetically engineered sweet corn has not been tested for human safety... I find this statement very hard to believe. Sun, Mar 18, 2012 : 1:23 p.m. This is the government and big biz talking. Genetically engineered corn and any other food product of such nature? Is unsafe. The diet drinks? Cause a whole host of problems for humans. Ban this product if Wal Mart does sell it. Buy local produce so you know where it comes from. It's important to be picky about corn. Buy only heirloom seed, organically-grown, pesticide-free corn this coming autumn for baiting lured deer to your kill zone in the hunt season. Some of that corn is likely to be accidentally consumed by our little friends in the forest, and none of us want to deal with the likely consequences of genetically modified chipmunks free to move about unfettered, running loose through the fens and warrens, and the schoolyards, of Greater Ann Arbor. I'd hoped to have seen the last of that kind of thing, once Pfizer packed up.